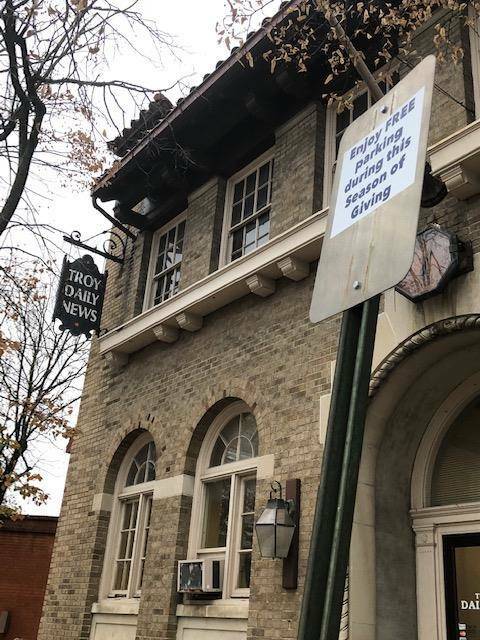 https://www.dailycall.com/wp-content/uploads/sites/30/2019/01/web1_freeparkingsign_ne2019118105551825.jpgThe city of Troy placed a moratorium on its two-hour and timed lot parking in downtown Troy in mid-November. Council will vote to extend the moratorium until March 31 on Tuesday. The moratorium is set to expire on Feb. 2. The city turned all the signs around and placed “Enjoy FREE parking during this Season of Giving” stickers to promote the program.